When you hear talk of someone who is “fickle” what do you assume? You might think the person is disloyal, self-centered, and uncaring about the people that he or she hurts along the way. But it could be that the person is simply a Scleranthus personality – and in its negative state. It could be that the fickleness isn’t limited to personal relationships – but is an over-riding inability to stick with even the most trivial decisions. Those in a negative Scleranthus state have trouble even deciding which shirt to wear or what to order from the dinner menu. In this state, the sufferer (for they do suffer) reacts strongly to all outside impulses and experiences wild mood swings. They don’t intend to be disloyal to friends or sweethearts – it’s just that one day they think the world of someone, and the next day don’t like them at all. As with all emotional maladies, the negative Scleranthus state comes about because of a disconnect with the Higher Self. Since Scleranthus has the soul potentials of poise and balance, those in the positive state are able to maintain balance in all circumstances – and they make and keep correct decisions quickly. 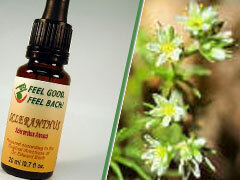 Treatment with the Bach Flower Essence Scleranthus can turn a fickle person into a decisive, loyal friend. If you think this might be YOU, visit our Bach Flower Reference guide and read more about Scleranthus. Or, visit FeelBach! and take the diagnostic questionnaire. Protect Your Pets this Week-end!